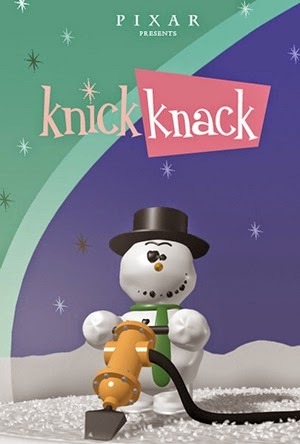 After scoring a hit with Tin Toy a year earlier, John Lasseter and the gang at Pixar tried their luck with another short film, 1989’s Knick Knack, about a snowman looking to have some fun. It all begins when the snowman, trapped inside a snow globe, spots a group of summer-themed keepsakes throwing a party on the other end of a souvenir shelf. After making eye contact with one in particular (a bikini-clad beauty), the snowman decides it’s time to leave his glass prison behind, yet try as he might, he’s unable to even so much as crack the side of the globe. Before long, another means of escape will present itself, but will the snowman be too late to join in on the fun? Whereas Tin Toy was designed to push the limits of computer animation (baby Billy proved a challenge to Lasseter and his group, who before that time had never attempted a human character), Knick Knack is a throwback of sorts, paying homage to the cartoons of yesteryear (Bugs Bunny, Tom and Jerry, etc) by featuring a very simple story laced with one outlandish situation after another (at one point, the snowman tries to escape his globe by dynamiting the glass from within, with hilarious consequences). The craziness is supported at all times by the film’s catchy musical score, written and performed by Bobby McFerrin (who a year earlier hit the big time with the a cappella tune “Don’t Worry, Be Happy”), which sets the perfect tone for the on-screen zaniness. Like Tin Toy, Knick Knack met with critical acclaim (The UK newspaper The Independent called it “A four-minute masterpiece”), and, after some editing to reduce the female characters’ bust sizes, was the opening short for 2003’s Finding Nemo. Following Knick Knack, Pixar wouldn’t produce another short film until 1997 (Geri’s Game), focusing its attention instead on feature-length pictures such as Toy Story and Monsters, Inc. But for those interested in learning a bit more about the studio’s history, movies like Luxo Jr., Tin Toy, and Knick Knack should be your first stop.